Plant description: Chlorella is a unicellular eukaryotic fresh-water green algae of the order Chlorococcales. It was one of the first organisms to evolved a true nucleus on Earth, over 2.5 billion years ago. Habitat, ecology and distribution: Chlorella spp. are widely distributed in fresh water all over the world, and are often a major component of phytoplankton populations in nutrient-poor waters. Chlorella spp. have evolved a variety of efficient nutrient uptake mechanisms and are able to rapidly increase in number and out-compete larger species of phytoplankton in lakes of low to moderate nutrient status. In certain situations Chlorella will form symbiont relationships with other organisms (e.g. the freshwater polyp Hydra viridis). Most commercial sources of Chlorella are cultivated in vats or ponds, indoor or under sunlight, with added nutrients to the water. Part used: Whole organism, with the cell wall processed and broken down to allow for the absorption of the nutrients and chemical substances contained within. A variety of proprietary techniques are used to break down the cells wall of Chlorella, including pressure steaming, spray drying (dehydration), grinding, and jet (impact) spraying. History: Chlorella was first discovered in 1890 by a Dutch microbiologist, Martinus Beijernick. Chlorella underwent some preliminary research in the 1950s and in the following decade showed some beneficial effects to decrease the side-effects of chemotherapy. The use of Chlorella however was hampered by the extremely durable cell wall that rendered its constituents indigestible. The Sun Corporation of Japan developed a proprietary processing called Dyno-Mill in the late 1970’s to break down the cell wall, and since then Chlorella has become the most popular supplement in Japan. Other techniques are now used to make the constituents of Chlorella bioavailable, but not all products in the marketplace will have undergone the proper degree of processing. Chlorella was also used as an experimental CELSS (Controlled Ecological Life Support System) in the Soviet Space program in the early 1960s, used to recycle air breathed by humans in a closed system. Chlorella was demonstrated to absorb the carbon dioxide that the humans breathed out and replenished the air with oxygen. 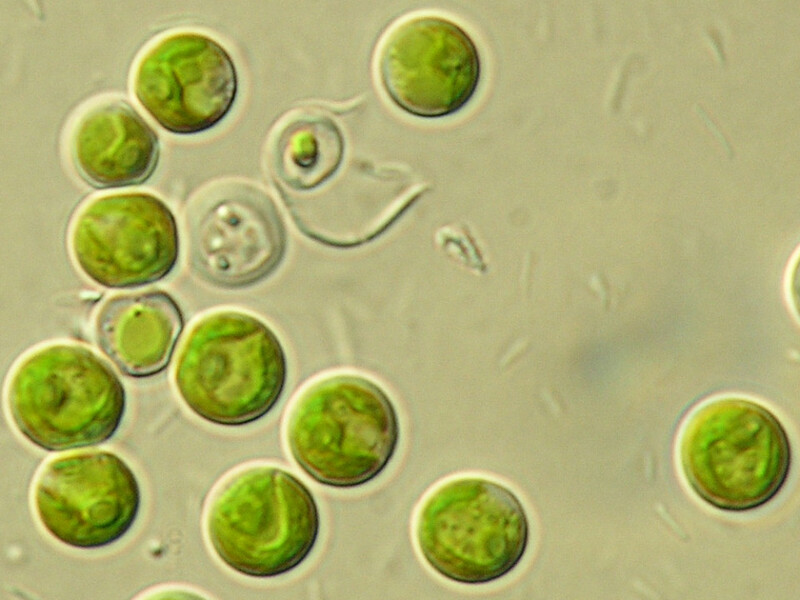 The culture of Chlorella was cultivated under artificial light, needing eight square meters of exposed Chlorella per human to achieve a balance of oxygen and carbon dioxide. A bioengineered strain is currently being developed to inhibit the development of mosquito larvae that normally feed on pond scum that contains Chlorella, by the expression of trypsin modulating oostatic factor (TMOF) in Chlorella, a peptide hormone that shuts off the production of stomach enzymes in mosquitoes (1). Constituents: Chlorella is so-named because of the exceptionally high amounts of chlorophyll contained within it, including chlorophyll A and B. (2-4%). Chlorella also contains exceptionally high amounts of protein (58-60%), on par with animal protein gram per gram, although it cannot be considered a viable alternative as too great a volume would have to be ingested to account for normal protein needs. Other constituents include beta-carotene (0.18%), all the B-vitamins (including B-12), vitamins C, D and E, macrominerals (e.g. calcium, magnesium, iron, phosphorus) and trace minerals, chlorella growth factor (CGF), chlorellan, dextran sulfate, fatty acids (e.g. linolenic acid, palmitlinoleic acid, palmitic acid), nucleic acids and fiber (Yance 1999, 230; Willard 1992, 84). Medical Research: The vast majority of research conducted on the benefits of Chlorella has been performed in Japan, most studies examining the antitumor properties of the extract and its purified components. In North America however, a 1990 clinical trial of 20 patients with glioblastoma (a kind of malignant brain cancer) were administered 20 grams of powdered Chlorella and 150 mL of liquid Chlorella, some in conjunction with conventional chemotherapy and radiation treatment. There was a striking improvement in over all health and immune status, with 7 out of 20 patients still alive two years later, compared with the 10% usually experienced with conventional treatment (Merchant et al 1990). Chlorella has also shown benefit in a few other conditions as well. One recent double-blind, placebo-controlled, randomized clinical trial examined the efficacy of 10 g of pure chlorella in tablet form and 100 mL of a liquid containing an extract of chlorella each day for 2 or 3 months, in 55 patients with fibromyalgia, 33 patients with hypertension, and 9 patients with ulcerative colitis. The overall results showed that daily dietary supplementation with Chlorella tended to reduce high blood pressure, lower serum cholesterol levels, accelerate wound healing, and enhance immune functions (Merchant 2001). Another clinical trial similarly examined the benefit of Chlorella pyrenoidosa in patients with moderately severe symptoms of fibromyalgia, consuming 10 g of ‘Sun Chlorella’ tablets and 100 mL of liquid ‘Wakasa Gold,’ each day for 2 months. The amelioration of symptoms was validated and quantified using semi-objective and subjective outcome measures systematically administered at clinic visits on days 0, 30 and 60 of the therapy. Eighteen of the 20 patients enrolled completed the 2 month trial. Overall, there was a 22% average decrease in pain intensity observed among the subjects. Blood samples taken on each occasion indicated no significant alterations in serum chemistries, formed elements, and circulating lymphocyte subsets. Compilations of the results of patient interviews and self-assessment questionnaires revealed that seven patients felt that the dietary supplement had improved their fibromyalgia symptoms, while six thought they had experienced no change, and five believed the symptoms had worsened over the time of the trial (Merchant et al 2000). • Antitumor: Researchers examined the immunostimulatory activity of a high molecular weight polysaccharide preparation isolated from Chlorella pyrenoidosa. Immunostimulatory activity was measured using a transcription factor-based bioassay for nuclear factor kappa B (NF-kappa B) activation in THP-1 human monocytes/macrophages. The polysaccharides obtained from Chlorella substantially increased mRNA levels of interleukin-1beta (IL-1beta) and tumor necrosis factor-alpha (TNF-alpha), and were found to be up to 1000 times more active for in vitro monocyte activation than polysaccharide preparations that are currently used for cancer immunotherapy (Pugh et al 2001). Chlorella vulgaris extract (CVE) was examined for its effects on the Ehrlich ascites tumor-induced suppression in the numbers of bone marrow and spleen granulocyte-macrophage progenitor cells (CFU-GM) in mice. CVE was found to significantly prolong the survival of mice noculated with the Ehrlich ascites tumor, suggesting a protective antitumor effect thought to be attributable to ranulocyte and macrophage stimulation (Justo et al 2001). Researchers assessed the modulatory potential of Chlorella vulgaris on murine skin papillomagenesis, and the role of xenobiotic detoxication system in modulating the papillomagenesis pattern. Topical application during peri-, post- or peri- and post-initiational stages of 7,12-dimethylbenz [a] anthracene (DMBA)-induced papillomagenesis, significantly modulated the tumor burden, the cumulative number of papillomas, and percent incidence of mice bearing papillomas. The results suggest the chemopreventive potential of Chlorella in murine skin papillomagenesis (Singh et al 1999). The intraperitoneal and oral administration of sterilized Chlorella cells was carried out every other day for 10 days before mouse mammary carcinoma (MM-2) or Ehrlich ascites cells were transplanted into the peritoneal cavity, or mouse leukemia cells (EL-4), transplanted subcutaneously. All control mice died within 20 days after each tumor cell ransplantation, while 73.3-80% of the treated groups survived over 60 days. Researchers showed that Chlorella cells and derivatives have no direct in vitro cytotoxicity, suggesting instead that the response may be mediated by host immune modulation (Miyazawa et al 1998). An acidic glycoprotein prepared from a culture of Chlorella vulgaris (CVS) was examined for its protective effect on 5-fluorouracil (5FU)-induced myelosuppression and indigenous infection in mice. Subcutaneous administration of CVS greatly reduced the mortality of non-tumor-bearing mice given a high dose of 5FU, and increased the LD50 value of 5FU for these mice. CVS also reduced the incidence of infection. The early recovery of hematopoietic stem cells, or cells responding to interleukin-3 or granulocyte/macrophage-colony-stimulating factor, was especially observed in the bone marrow of CVS-treated mice on days 4-9 after the injection of 5FU. When tumor-bearing mice were given CVS during treatment with 5FU, CVS prolonged the survival of mice without affecting the antitumor activity of 5FU. In addition, CVS was itself shown to exert an ntitumor effect (Konishi et al 1996). The oral administration of a hot water extract of Chlorella vulgaris (CVE) restored immune function in acquired immunodeficiency syndrome in mice induced by infection with LP-BM5 murine leukemia virus. Increases in the number of CD4+ CD8- and CD4-CD8+ alpha beta T-cells were noted (Hasegawa et al 1995). The growth of Meth-A tumor in CDF1 mice was inhibited significantly by injection of a hot water extract of a strain of Chlorella vulgaris (CE) into the tumor or into the subcutaneous tissue near the tumor. The augmentation of resistance by CE is thought to require the participation of T cells and macrophages. Mice treated with CE exhibited antigen-specific augmented resistance against rechallenge with tumor (Tanaka et al 1984). The antitumor activity of a water-soluble substance (PCM-4) extracted from Chlorella regulararis was tested against murine transplanted tumors in rats and mice. The oral administration inhibited both the growth of Sarcoma 180 and Meth A, subcutaneously implanted into mice, and ascites hepatoma AH 44 and AH 41C, intravenously implanted into rats. PCM-4 also showed antitumor activity against Sarcoma 180 and Meth A by intraperitoneal administration. The finding that PCM-4 has no direct growth-inhibition effect on tumor cells in vitro suggests that the antitumor activity may be elicited by host response (Nomoto et al 1983). • Pepticulcer: The oral administration of dry powder of Chlorella vulgaris (CVP) showed prophylactic effects in water-immersion restraint stress-induced and in cysteamine-induced peptic ulcer models. The effects were suggested by the authors to be mediated by the “immune-brain-gut” axis (Tanaka et al 1997). • Heavy metal toxicity: There are several published papers investigating the effects of Chlorella as a remedial agent to treat toxic waste water. Willard reports some German studies from the early 1950s that indicate that Chlorella demonstrates this effect in the human body. In one study, Chlorella was seen to significantly enhance Cadmium excretion from the body via the urine. Similar effects have been observed for mercury, copper lead, uranium, insecticides, pesticides and polychlorinated biphenyl (PCBs) levels (1992, 85). Contraindications and cautions: Some individuals have difficulty digesting the cellulose in Chlorella products and may experience gastrointestinal problems. This can be ameliorated by taking a dietary enzyme that contains cellulase. Medicinal uses: Chlorella is an important remedy to prevent and treat cancer, modulate immune function, and remove toxic substances from the body. Its use in cancer extends to prevention, as an adjunct in conventional treatment to limit the effects of chemotherapy and radiation, or along with other botanicals and supplements used as a primary treatment of cancer when conventional treatments are either refused or will have little benefit. Chlorella is an exceptionally popular supplement in Japan where it is taken by large numbers of the populace to protect against environmental toxins so prevalent in this highly urbanized society. Chlorella is often used as a ‘chelating’ agent in heavy metal toxicity in clinical practice, such as that caused by mercury amalgams, often used in combination with Cilantro (Coriandrum sativum fresh herb), herbal cholagogues and sodium 2,3-dimercapto-1-propane sulfonate (DMPS) (Aposhian et al 1997). Herbalist Terry Willard mentions a few Japanese studies in which Chlorella was found to be helpful in the treatment of acute pancreatitis, often caused by alcoholism or gall stone obstruction (1992, 84-85). The mechanism of action appears to be chlorophyll, inhibiting the protease enzymes involved in inflammation (1992, 85). In a similar vein, Chlorella is often taken before a night of drinking to prevent hangover. Willard also mentions that Chlorella has been shown to treat periodontal disease, tightening the gums and promoting the growth of new gum tissue when used as an oral mouth rinse (1992, 85). In regard to digestive function, the fiber in Chlorella helps to modulate the gut ecology, promoting the growth of ‘friendly’ bacteria such as Acidophilus and Bifidus. Although tablets are often prepared from Chlorella, they may contain an unacceptable level of stabilizers and ‘glues’ to hold the Chlorella powder together, and may interfere with absorption. As a result, pure Chlorella powder or liquid Chlorella preparations are preferable.